The actual journal you use can be a spiral notebook or handmade paper bound in leather, whatever you like. However, I recommend a loose-leaf notebook because it has the advantage of being able to be divided into sections, which you can add to over time. Your journal can be as expansive as you want it - it is, after all, your creation and tool - but I will give you guidelines (adapted from Ira Progoff's Intensive Journal method, which I have found works very well.) Don't hesitate to add drawings or pictures. Daily Log: Here is where you write down your actual experiences with animals. If you are struck by a documentary or magazine article or book, describe your thoughts here. This section can be used as a repository for anything that the following sections don't include. Dream Log: Here you will have a chronological record of your dreams about animals. Have a separate section for Dream Enlargements. 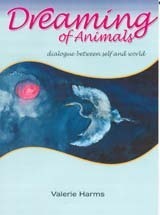 To work with a dream about animals, you will find that the material I offer in the contents of my book can be used as a reference to discover your dream's meaning. Write down your associations, taken from your own experience with the animal and the literature you've read. You may be inspired to look up more information about an animal's behavior and needs, as well as its mythology or symbolic values in the art and religion of different cultures. Life History: From time to time it's well worth your time to go back over your life and recall your experiences with and attitudes toward animals in the past. Follow these steps: 1. Divide your life into about 10 main periods, beginning with early childhood and ending with the present. After identifying these periods, go back into each one and write about your relationship to animals at that time. Perhaps you had a beloved pet. Maybe for school you raised tadpoles and frogs. Did you go into the woods and see animals or notice the birds and fish around a beach? Did someone take you hunting? As you matured, what were your attitudes toward animals? Perhaps you experimented with vegetarianism as a protest against the slaughtering of animals or became a member of a conservation organization or went on a wildlife-viewing vacation? 2. In this section make room for specific memories in regard to animals. Describe in as much detail as you can moments with animals that you treasured. Perhaps the cuddling of a dog or cat or the grief you felt at the death of an animal. Times of shared friendship or communication. Your awareness of an animal's personality. Open out these memories as much as you can, recalling the smells, sounds, colors, textures, and emotional tones. Dialogues: This section comprises the written dialogues you may have with animals on occasion. Sit down in a quiet place with your journal open. Visualize yourself with an animal you knew in the past, one you'd like to know more about, or one that you sense serves as a power (or totem) animal for you. The main criterion should be that you feel you could open your heart to this animal or that you would like to have access to the kind of knowledge this animal represents. After you have selected your animal and with eyes closed visualized yourself with it, start a dialogue. You speak to it and let it speak back to you. Let the dialogue unfold as spontaneously as possible. Until you get used to this mode of communication, simply greet the animal and go from there. Or, you may start with a question that has been preoccupying you. You may even go on at length about a matter that concerns you, but don't forget to listen for the animal's response. Remember, this is to be a dialogue, not a monologue. This dialogue technique helps stimulate deeper layers of conscious and unconscious realms of knowledge. It seems the deeper you go, the more your psyche can extend its boundaries and take in other animal consciousness. That is why you don't want to write this dialogue as if in a play of your own direction but let it unfold in its own meandering, surprising way. Let the animals speak, and then assess the wisdom you gain. As a result of this inner work, it is always important to ask where does it lead you? The dreams, meditations or dialogues will apply to specific areas of your life, after which you should determine a specific action to take. An action could be to paint a picture, write a poem, change your lifestyle, help save a specific animal or commit yourself to a political action, such as supporting humane and sustainable farmers. Keep in mind that the step that you make in the outer world should emerge from the inner one to be the most effective. If you do the above inner work, there is no doubt that the very core of your self will evolve and along with it your contribution to life on Earth. You have gifts to make to other beings but to do so seems to require the deep inner work that extends our boundaries to include all species.